What is new in SEM for business? Rebecca Caroe discusses the Wild West of agency service providers and how to avoid getting ripped off by a marketing firm. Louise runs the Creative Store – a recruitment and placement agency specialising in the creative industries. This is her interview with Rebecca published in August 2018. When starting our companies, Louise and Rebecca shared offices in the BizDojo and shared jokes about English sweets and beer! Q. How do you define search engine marketing? A. Anything you do for your business that gets it showing up in search results. So this can cover keyword SEO on your website, having a strong LinkedIn profile, guest articles, Slideshare presentations and advertising. Q. Are many companies doing a terrible job of this? A. It is my view that SEO service provision is a “wild west” there are a lot of cowboys. This is not just a supply side problem, it’s also caused by clients who do not brief well, are not experienced buyers and have unrealistic expectations of what is possible. We know that business owners come to our events because they want to learn. Many tell anecdotes about past experiences which didn’t go well. To challenge and counteract the wild west, I am part of a Facebook group called The Ethical Digital Marketing Community (EDMC) – you’re very welcome to join us, share and learn together. I certainly don’t claim to have all the answers. Q. How do you identify your clients? A. Our clients are businesses who sell to other businesses. Many are new to marketing and do not have in-house staff with expertise. Normally, they aren’t going wrong – they are getting started. For many, the part of their marketing which they notice is not performing is their website. It’s not showing up in search, they aren’t getting inbound enquiries and competitors are more prominent. We recommend they do a self-test using WooRank Checker or Hubspot Website Grader Tool and see what their website score out of 100 is. That identifies many of the areas where they’re underperforming. Q. If clients wish to engage you, is this on a retainer or do you do a sweep of their work for a charge? A. We do both. Unusually for an agency we are very happy to train and up-skill the client’s team and also work with existing agencies who they already have on retainer. Our strategic leadership allows both to deliver better outcomes for the client – and that is always the end goal. By having a clear strategy and goals we are able to brief agencies better, they work to a clear objective and the client trusts us both to get the results. It’s a win-win-win scenario. Q. You are hosting an exciting event with Blair Enns in October about this subject – how do you put a price on your work – what will we expect to see from this workshop? Q. Who needs your services the most? A. Owner-managed businesses where the owners don’t know modern digital marketing and are too busy to do it themselves. Q. Where is the future of SEM going? A. Deeper and wider into ever more businesses. Good SEM techniques are straightforward to apply to any business. I summarise this into – State what you do, Answer questions clearly and Keep your focus on local or niche audiences. Then repeat and improve. Q. Any helpful tips and hints to our clients on their SEM and simples fixes they could be applying? A. Sure – Three things. 1 do a website check and see what your score out of 100 is. 2 connect your Google Analytics and Search Console so you can see the queries driving your natural search traffic. 3 review where your last 10 new clients came from – was it referrals or web search or directories or public speaking or something else. Then double down on what’s working and do more of it. A. More collaborative relationships with other agencies and mutual clients. I firmly believe that collaboration is an under-used business principle and it is working amazingly well for us. Who doesn’t want to look good in front of the client? Anyone should know that to establish a good online brand presence, you need a good Search Engine Optimisation (SEO) strategy. Keywords are a main part of that strategy – they’re more than just using the right tags to find relevant blog posts – they help boost your business’ search results so your website gets more traffic. 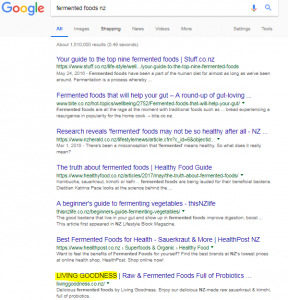 Last year, we helped Living Goodness develop an SEO strategy that saw them appear on the front page! And to top off the cake, it was also the first time that Living Goodness ranked higher than a competitor. Seventh place! Not too shabby. In this blog article, I’ll show you three key skills that we utilised for their SEO strategy, and show you how you can put them to work on your own business. 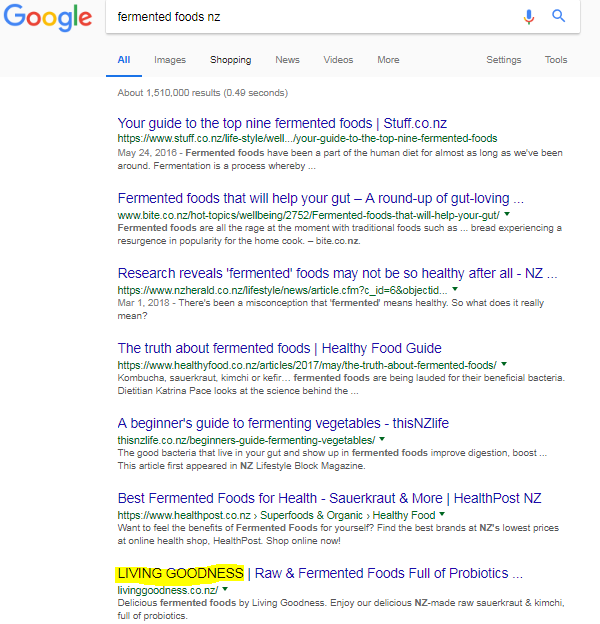 For example, Living Goodness were ranking for “fermented foods nz” (though they appeared on the second page of search results). 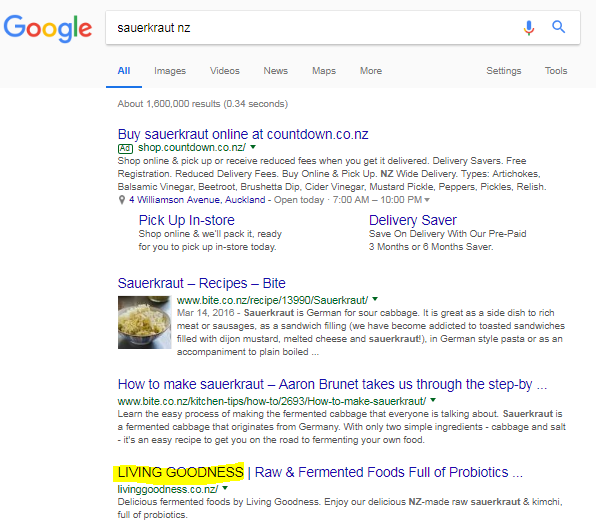 They wanted to rank higher for this search term, and also wished to show up for “sauerkraut nz”. Which we achieved, by the way. We went on to conduct our own research to find relevant keywords that would complement these. A handy tool that we turned to is called Answer the Public. 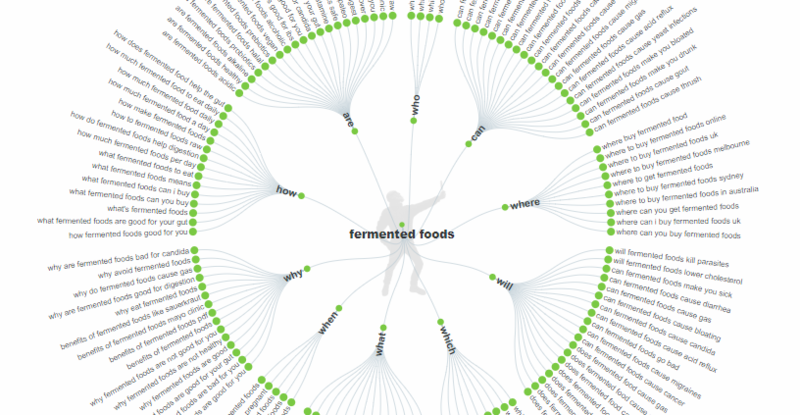 This allowed us to see what users were also searching for alongside the terms “fermented foods nz” and “sauerkraut nz”. We picked up key phrases and words such as “probiotics”, “raw”, “organic” and “kimchi” alongside many more. This also gave us a good starting point for blog article ideas. These were just a few places where we implemented keywords into the existing content in a manner that was natural and flowed. Being a business that sells fermented foods, this wasn’t a problem. We also made sure we used a mix of these keywords because no one likes repetition (especially not Google!). Keywords aren’t the only way to boost SEO. There are many things that affect search engine rankings, and relevance is a big contender. If people aren’t spending long enough on your website and are bouncing away quickly (tip: check the bounce rate in Google Analytics), it may very well mean they’re not finding what they are looking for on your website. Internal links are a great way to boost SEO and retain website traffic. If you aren’t linking to your products whenever you mention them, it’s a huge opportunity wasted. You also want to encourage a longer customer journey by suggesting other pages that are relevant. For Living Goodness, we added links to their stockists page and social media handles on the recipes pages. 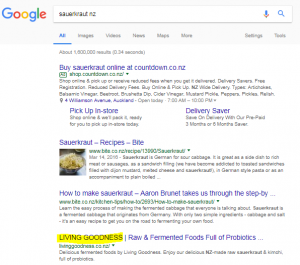 This call-to-action prompted visitors to seek the closest stockist after reading a delicious recipe – “Are you running low on delicious sauerkraut or kimchi? Check out your local stockist here.” The social media links also encouraged visitors to share any of the recipes they’d followed. Being a foodie Instagram account, any photos using a Living Goodness product was free user-generated content, and of course, we were going to make the most of it! As you can see, these tips are all very simple, easy and free to do. Hopefully, you’re able to apply them to your website straight away. All these were tasks that we did as part of our SEO Starter Pack. It’s a comprehensive analysis of a website with actions to improve SEO and a recommended guide for next steps.